Despite being a bit of an anti-hero, Bane is the world's worst role model and rising star. By amping up on chemical nasties Bane gets the cajones to break the back of Batman and his own 'blockbuster before it's even released' Hollywood film. 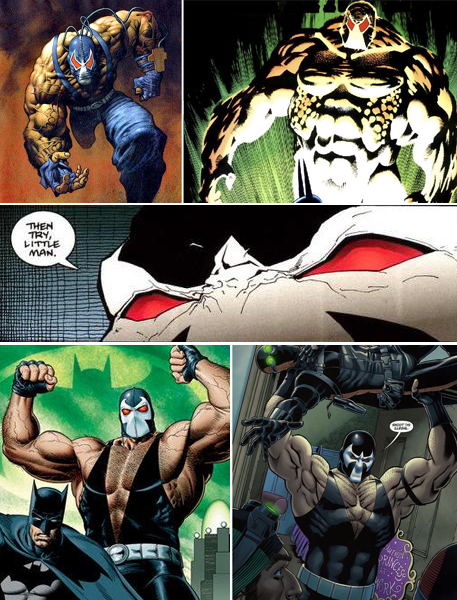 Now, before his face gets thrown everywhere in the lead up to The Dark Knight Rises, here are my picks for The Top 6 Bane Artists Ever (up until now). 6) Alex Horley Trading card art should never be left that small. This piece by Alex in an almost 2000AD style proves just that. 5) Kelly Jones One of the best bat-artists ever to walk the planet, Kelly's trademark shadows gave Bane a hell of a lot more punch. 4) Roger Robinson Missed Roger's animated movie in print Bane rematch in Azrael #36-40? Get ye to yonder comic store asap-eth! 3) Brian Bolland Some people say there exists a DC character Brian can't nail - me? I'm yet to see it. 2) Nicola Scott Like everything in Secret Six Nicola's Bane mastered the details. Here as Bane taunts the henchman with 'Shoot the illegal', the sign in the background says 'Caution: Princess At Work' Great stuff! 1) Daniel LuVisi Any guy who draws Bane riding a dinosaur is all right by me. 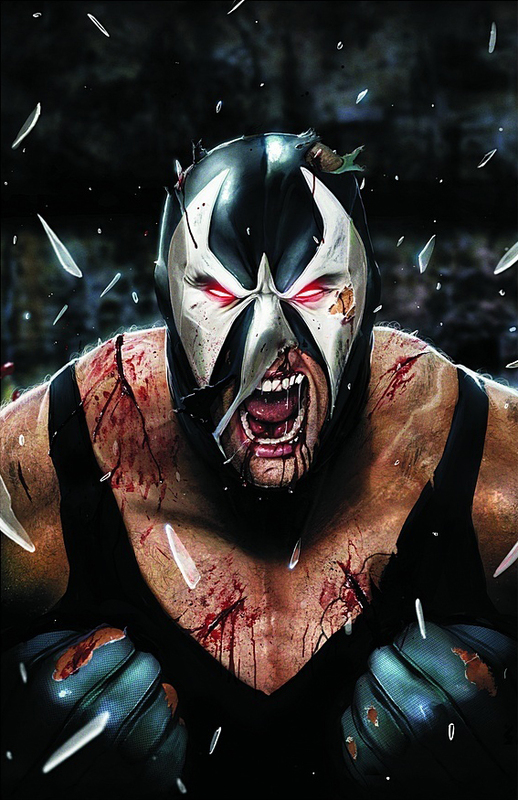 While that's not the Secret Six cover I've posted of Daniel's, this one still screams "My name is BANE!!" - as the muscle-clad menace is prone to do. Who is your favourite Bane artist? I'm pretty ticked off that two of the promised movie trailers were not delivered these last few weeks. Amazing Spider-Man was a no-show at our theater before Captain America, and Harry Pooper failed to bring us the Dark Knight Rising. I think it's the same here Craig - at least I haven't heard of it in people talking (I can't do Harry Potter to find out - I'm allergic). Speaking of which though a 300 question is on Who Wants to be a Millionaire - so you never know where comic stuff is going to pop up! my wife's a huge fan so I've been dragged to the theater to every one. They've gotten better as the plot gets darker, but still not my favorite. Now I really passed on this last movie. Tomorrow and only tomorrow Captain America premieres here and if you want to laugh, no Green Lantern until now. I don't know why the delay. I also eager for Dark Knight Rising. I'd add Man of Steel to that list to Aliera - I'm praying for an awesome Superman movie! Me and my friends we all are big fa of these amazing artists. We like their work and we always follows their blogs and articles.